Tejano Civil War Sketch by Daniel Cardenas . EDINBURG — A map of the region is standing here at the center of the University of Texas Rio Grande Valley visitor center lobby, pinned with symbols that show the location of Civil War landmarks. 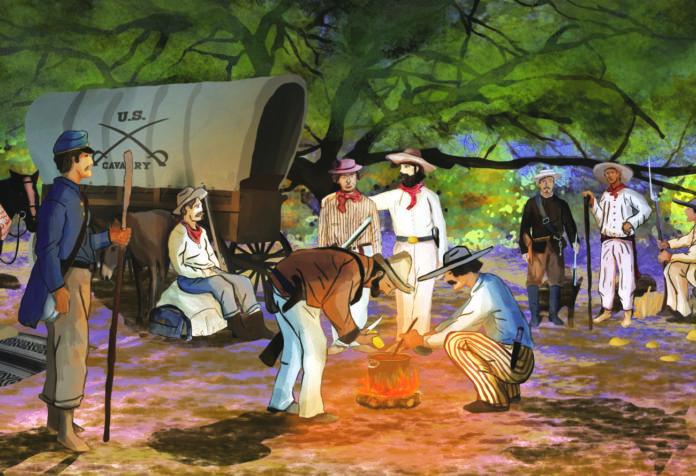 Showcasing the 200 miles between Brownsville and Laredo, the map allows visitors of the Valley’s Civil War Trail exhibit to see where historic events took place. Learning about battles is just one part to the “War & Peace on the Rio Grande Valley” museum exposition. Though the history display has been open to the public since February, the banners, artifacts and life-size mannequins will be open to the public from 9:30 a.m. to 4 p.m. Saturday at the university. Guests will also have the opportunity to attend a public lecture series that will run throughout the day and meet reenactors who will be impersonating seminal figures of Civil War leaders from the region. Roseann Bacha-Garza, program manager for the UTRGV Community Historical Archeology with Schools Program, CHAPS, said the event is designed to foster space where people can engage with local history. The posters and banners of the exhibit were produced and designed by UTRGV CHAPS students and staff, which is scheduled to travel to the Port Isabel Historical Museum, Zapata Historical Museum, then make appearances in Brownsville, Laredo and Corpus Christi. Bacha-Garza said the exhibit is booked up to 2020, and that her hope is to one day send the display to San Antonio. The exhibit will be available to view in the UTRGV visitor lobby until June 19. During the event, “Just a Ferry Ride to Freedom,” a 10-minute documentary that covers the underground railroads that passed through RGV ranches prior and during the Civil War will be screened in the UTRGV Student Union Theater. The film was produced by Nick Taylor, a communications professor at the university and Damaso Creative Video Services. Additionally, attendees will be able to sit in a public lecture series that features UTRGV history professors and scholars from across the country who have assisted in conducting research for the project. Speakers will present their own Civil War-related specialties, some being colored troops, the economy of the region and battlefield archeology. While the lecture series goes on, film runs and the exhibit is open, attendees are also welcomed to meet Civil War impersonators at the Chapel Lawn of the university, who will be donning the traditional uniforms of their respective leaders. The actors will be settled in a Civil War era camp set-up, which will be decorated with various camp props to bring the content to life, according to Bacha-Garza. One of the re-enactors will impersonate Confederate Colonel Santos Benevides, the highest ranking Tejano in the confederacy and a Laredo native. With the exhibit, documentary, lectures and re-enactors, the heart of the program is to educate locals about the historical richness of the Valley. For this, Bacha-Garza said that student involvement is what moves the program. This semester, 13 students of an advanced history course have been preparing for the event by learning everything there is to the Civil War events that occurred in the Valley. On Saturday, they will be the curators and docents walking residents through the exhibit.